As an early childhood educator, one of my “go to” kid sayings comes from the author of a favorite parenting book – Conscious Discipline, by Dr. Becky Baily. “Children are either extending love or calling for it.” Period. End of story. There is no hidden agenda or premeditation for intentional mischief, particularly in the first five years of life. 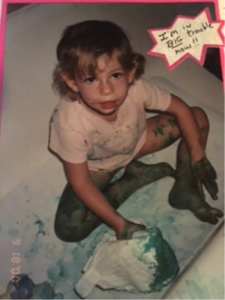 Now I know what you’re thinking – “I can see it in her eyes when she is getting ready to be naughty!” I remember that look well (like the one I got just before the picture here of my daughter, then two, now 20, was taken)! But in reality, ‘being naughty’ is not the motivation. Kids are exploring their world, their immerging independence, and, as they do, testing the boundaries that come with that territory. And such testing is really a call for guidance. When you have conflict with your little one, consider it a call for help, and an opportunity to teach. They don’t think “Let me see what I can get away with,” or “I’m gonna do this because my mom told me not to.” Truly, they do not. They are needing to be nurtured and ‘fed.’ Just as the flowers in a garden crumble when they do not have food and water, so do young children. They crave, want and need your attention, and they will subconsciously go to all extremes to get it, one way or another! We can learn a lot of lessons as we embrace, with certainty, Becky Bailey’s statement. One of those is that young children desperately need our time and attention. I was reminded recently of one of the first extensive formal research studies using our Kindermusik® curriculum to measure effects on cognitive advancements using standard intelligence tests. 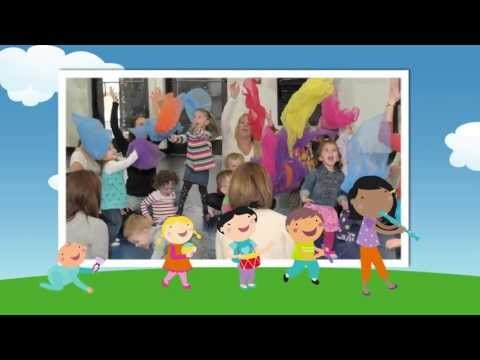 The study was done at Sam Houston University in Texas, and measured 66 children, 4-6 years old, before and after an entire school year, half of whom participated in Kindermusik for the Young Child® classes and half of whom did not (the control group). The results were dramatic: at the end of the study, all Kindermusik students had drastic gains – from the 50th percentile up to the 87th percentile, regardless of their socioeconomic background or race (one third of the kids in BOTH groups were from Head Start). But the MOST dramatic finding in these results lay in a surprising factor: the largest gains in post-testing were in kids whose parents were in “high compliance,” participating in weekly home musical play and simple assignments, regardless of their background. The Kindermusik kids with “low compliance” parents, even, had gains from the 50th to the 78th percentile. However, those with “high compliance” parents rose to above the 87th percentile. It is even more impactful when you know that the definition of a “high compliance” parent was one who spent just 30 minutes a week at home in musical play and learning. TIME together matters in your child’s long term ‘smarts,’ if you will, and in Kindermusik, we see that it’s not time drilling numbers or letters, but, rather, quality time exploring and creating and interacting. Joyful, attentive parenting. And, by the way, research tells us that when we effect our child’s cognitive development in the first decade of life, the advances are permanent. Another lesson we can learn is that what children sense and feel, in their hearts, motivates their actions, and is grounded in physiology. According to HeartMath Director of Research Rollin McCraty, “The heart is a sensory organ and acts as a sophisticated information encoding and processing center that enables it to learn, remember, and make independent functional decisions.” The heart generates a powerful electromagnetic energy field that radiates and can be measured 8 – 16 feet away. What that means, practically speaking, for us as parents, is that children can sense our feelings, and they respond accordingly. I cannot tell you how many times that a child in my class, for the very first time, at an age typically associated with stranger anxiety (like 18 months!) has ended up on my lap, particularly if their own parent was disengaged or seemingly disheartened. Time after time, over 25 years in this business, a parent has commented, something like “He never goes to anyone. I can’t believe he came right over and sat in your lap.” That child was calling for love, and sensed that I was extending it, because my heart’s energy field was sending out that signal. And when the child joined me, my positive energy and love transferred to him, and he needed it. Studies have shown that the heart’s electromagnetic field, as measured by an electrocardiogram (ECG), in one individual can be detected and measured in another person when the pair either were seated within about three feet of each other or held hands. When people touch or are in close proximity, a transference of the electromagnetic energy produced by the heart occurs. Isn’t that powerful? What we feel for another has real power to effect their being, in the very moment they are in. And when our children are in a state of upset, likely, we are feeling that in our hearts as well! The reverse is also true. In fact, we might ask ourselves, whose upset came first? Was theirs a result of sensing what we were feeling? Are they calling for love? When we stop and extend love to them, our hearts can join, in much more than just an emotional sense. In today’s world of premeditation, anger and violence, I am thankful to work with children who simply radiate love, or the need for it, and blessed that I can provide parents strategies to meet their children’s needs in ways that enhance the moments of their often long, sometimes challenging days. We use music to make the navigation of parenting easier, more joyful and life for families richer. Love everyday. That’s my job. And by that count, I think I have the best job in the world! Previous post: Gratitude with Intention – a Powerful Choice!